Omotesando is the famous for a fashionable street. I've posted about Takashita street a previous post. The shops in Takeshita street are for teens, but the shops in Omotesando are for more grown-ups. And the street is famous for the zelkova trees lined street. I really feel good to walk in Omotesando for shopping seeing these zelkova trees. I took a photo on the pedestrian bridge. This is the other side of the street. The zelkova trees turned red a bit. This is Omotesando Hills. This is the shopping complex　built in 2005. Before it was built, there was the 80 years old apartment here. 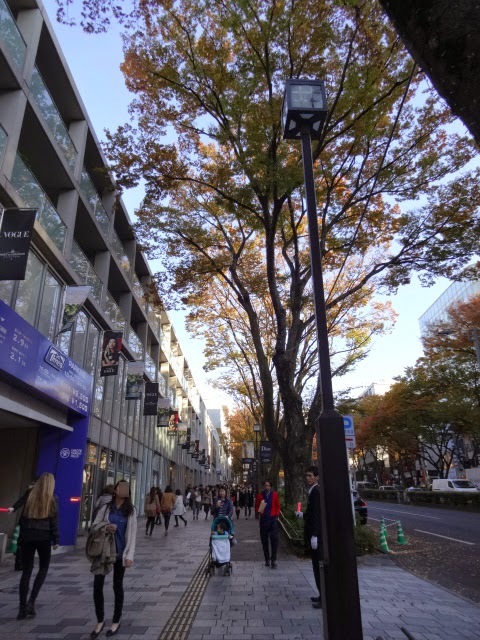 Omotesando Hills was built for redevelopment. This is La Foret Harajuku. It's a department store and museum. There are many unique shops here. I'll introduce them when I go to La Foret next time. I went to my favorite shop ZARA. ZARA is a Spanish closing. I like their design. I bought this roomy pants. It's very conformable. I love it!